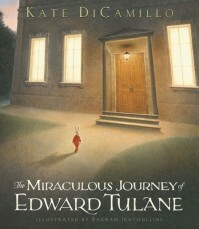 Edward Tulane is a kept rabbit. His owner dresses him, sets him up for his day and loves him unconditionally. But he only thinks about himself. He feels no affection for anyone other than himself. Soon after they set off on a long journey, Edward is separated from his owner and sets off on a journey of self discovery as he moves through the different lives of those who find him. Edward is learning the art of less of self and thinking of others. Even though he is a child's toy, his many years of traveling through the many phases of his new owners lives, he learns to appreciate the story that Pellegrina told his first owner many years ago. Join Edward on this lovable journey!! I suggest this book for kids ages 8-12.